Eleusis was a shrine located fifteen miles north-west of Athens on a gulf which is almost entirely closed by the island of Salamina. Today the archaeological area is surrounded by an industrial district and the gulf is used by shipping companies as a parking lane for unused vessels. The life of the shrine spans more than a thousand years: the exact date of its foundation is unknown, but it is generally set in the VIIth century BC. In 392 AD Emperor Theodosius declared the Christian faith the sole religion of the Roman Empire and he decreed the closure of Eleusis as well as that of other non-Christian shrines and oracles. 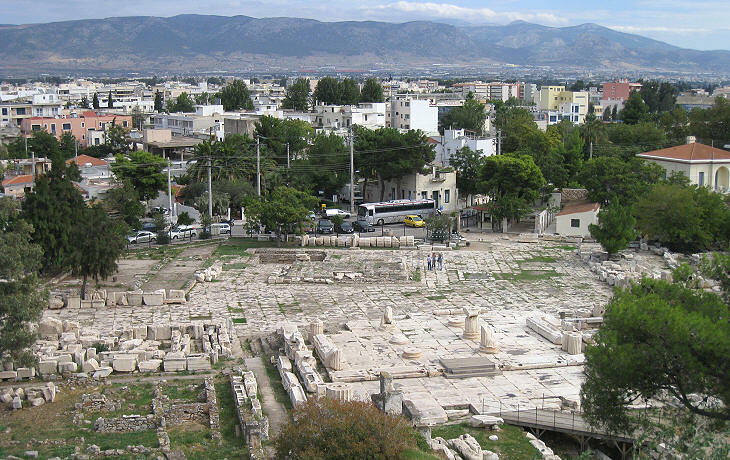 The interest towards the ceremonies performed at Eleusis did not vanish immediately and in the Vth century Neoplatonist philosophers and in particular Proclus looked at them as a way to develop a universal faith. In 529 the closure of the Academy of Athens decreed by Emperor Justinian and the policies he implemented to eradicate non-Christian beliefs led to the abandonment of the shrine. 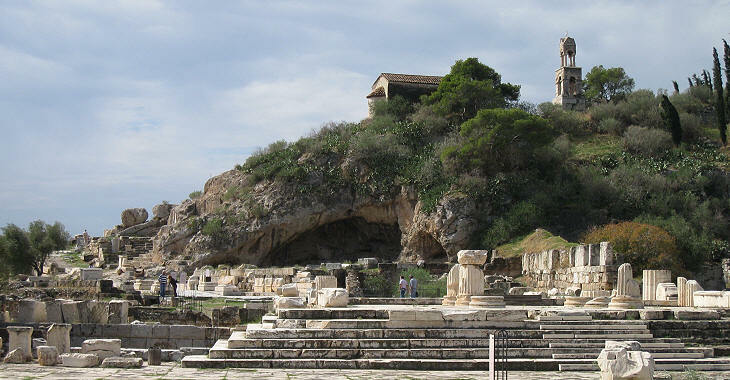 The fame of Eleusis was due to its initiation rites (Greater Mysteries and Lesser Mysteries); those admitted gathered in the Telesterion, a large hall rebuilt several times; Telesterion means "place for initiation"; the initiates sat on rock cut benches and they were lectured about the content of the ceremonies and shown the sacred relics kept in the shrine. We know relatively little about the actual rites because those involved in them were bound by a secrecy vow. 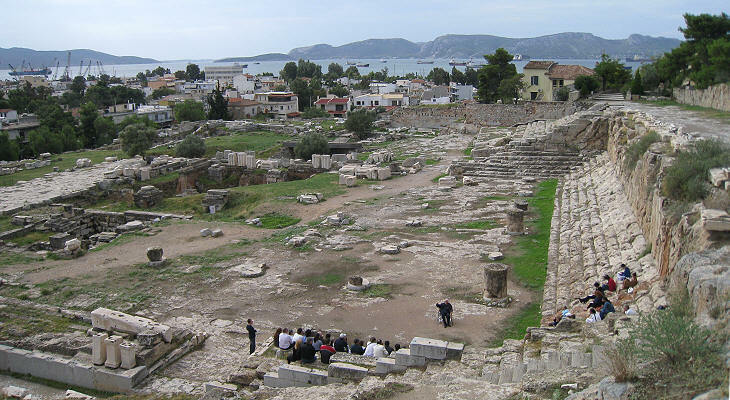 Initially the ceremonies held at Eleusis were a fertility rite and the celebration of a society based on farming. It is generally thought that the earliest beliefs in Greece and Asia Minor revolved around the cult of a goddess, a Mother Earth named in different ways. A relief found at Eleusis portrays two women (Demeter and her daughter Kore/Persephone) bestowing ears of wheat on Triptolemus, the son of a King of Eleusis, but in this context a personification of mankind. Triptolemus was supplied with a wooden plough and taught how to use it. The relief is illuminating about the superior role which female deities had in the early stage of civilization. Demeter is thought to mean Earth-mother; her Roman equivalent is Ceres, goddess of grains. The initiation ceremonies were preceded by a procession from Athens to Eleusis. This explains the orientation of the various buildings making up the complex of the shrine: the initiates gathered in a large esplanade where they ended a period of fast by drinking kykeon (a mixture of water, barley, honey and leaves), which is thought had psychoactive properties. 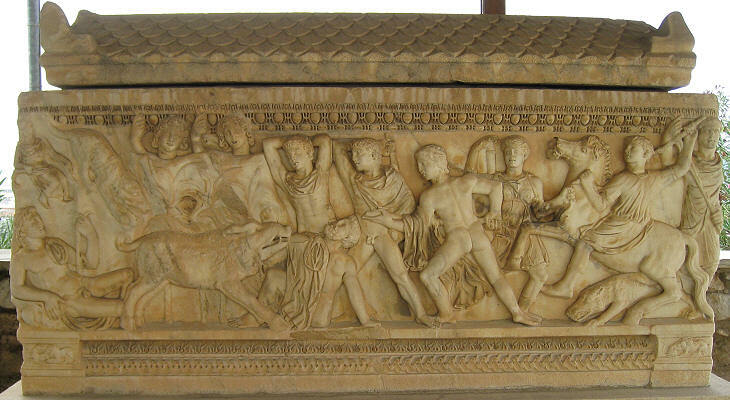 The Roman conquest of Greece did not impact on the fame of the shrine; the rule which restricted the initiation rites to the Athenians was in various ways circumvented to allow access to all citizens of the Empire. Cicero, who was very critical of Greek influence on Roman customs, nevertheless praised the Eleusinian Mysteries "for by their means we have been brought out of our barbarous and savage mode of life and educated and refined to a state of civilization; and as the rites are called initiations, so in very truth we have learned from them the beginnings of life, and have gained the power not only to live happily, but also to die with a better hope". 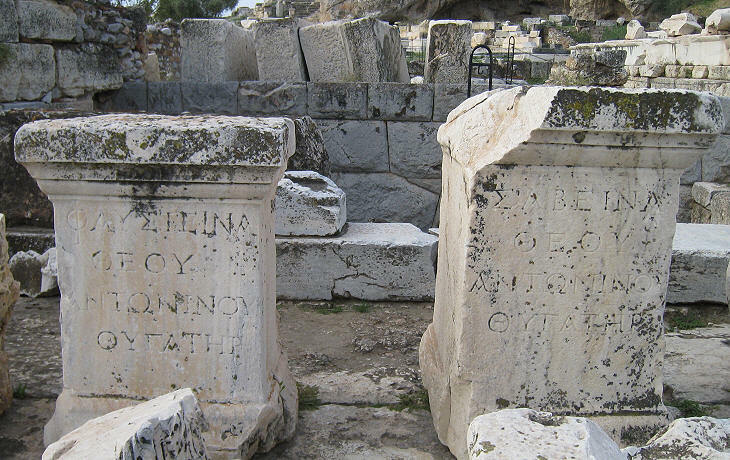 Consul Appius Claudius Pulcher (97-49 BC), a contemporary of Cicero, built a new entrance to the acropolis of Eleusis; its decoration is still referred to the traditional celebration of farming, but at that time (as Cicero's words testify), the rites were already seen as a mean to gain an insight into the mystery of life (and afterlife). The inscription dictated by Appius Pulcher is written in Latin, whereas in the following centuries the Roman emperors preferred to use Greek for their inscriptions. 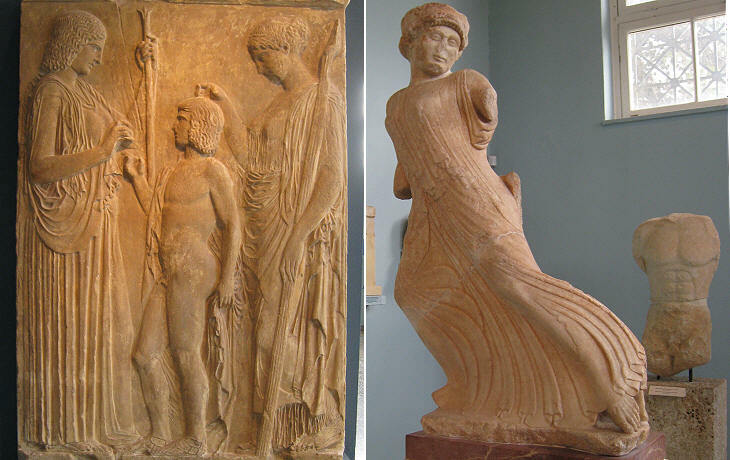 The presence of caverns which were thought to give access to the underworld indicates another aspect of the myth of Demeter which explains why the Eleusinian Mysteries dealt with afterlife. Demeter had a daughter, Kore, to whom she was very attached; at one point the young woman disappeared; she was abducted by Hades, God of the Underworld, as she was picking flowers in a meadow near Eleusis. For nine days and nights Demeter sought Kore; she then came to the court of Celeus, King of Eleusis, where Triptolemos, who herded his father's cattle, told her that ten days before a chariot drawn by black horses appeared in the fields, its driver's arm clasping around a shrieking girl. In retaliation against Zeus who had allowed the abduction to occur, Demeter forbade the trees to yield fruit and the herbs to grow and she swore that earth must remain barren until Kore had returned. Eventually a compromise was reached: every year Kore (with the name of Persephone) was to spend three months with Hades, as Queen of Tartarus and nine months with her mother (for the Romans this myth was referred to as that of Proserpina and Pluto). Emperor Hadrian was initiated into the Eleusinian Mysteries; he and his successors Antoninus Pius, Marcus Aurelius and Commodus all protected the shrine and contributed to its embellishment; it is thought that the changes were completed by Commodus after a raid by Sarmatians damaged the sanctuary in 170. In particular the changes included a new grand entrance with columns of a colossal size and two triumphal arches. 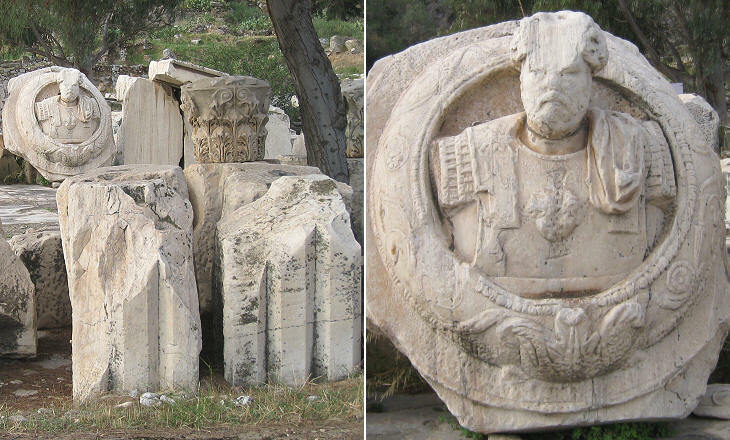 A bust of Emperor Antoninus Pius in a medallion is a forerunner of many Baroque monuments. 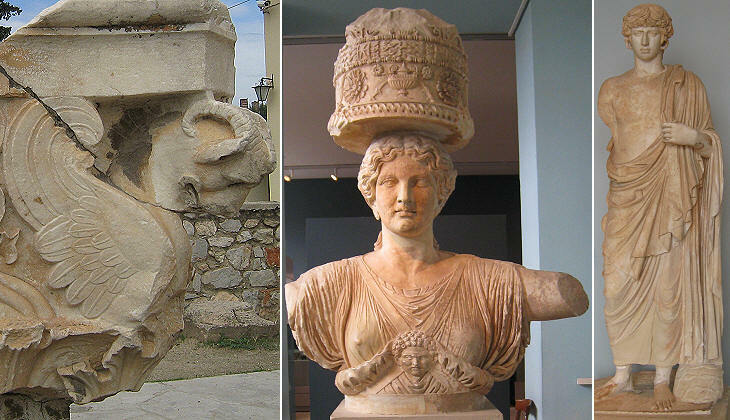 The IInd century Roman enlargement/reconstruction of Eleusis included several references to the women of the imperial family; unfortunately for archaeologists and historians they usually were named either Sabina or Faustina. It seems most probable that a temple was dedicated to Vibia Sabina, wife of Hadrian, and another one to Annia Faustina, wife of Antoninus Pius. This was part of a policy implemented by Antoninus Pius in order to show that the Roman emperors abided by family values; this after public opinion had reacted badly to the deification of Antinous, a young man loved by Hadrian. A statue of Antinous was worshipped in an underground temple; the head is very similar to that of a (much superior) statue at Delphi, but the body is most likely that of a previous statue. The museum attached to the archaeological area houses many exhibits of the Roman period. 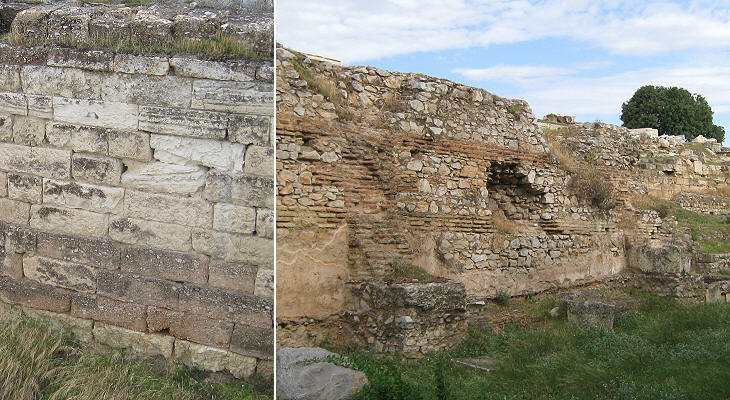 After the 170 Sarmatian raid and most likely after the 267 invasion of Greece by the Heruli, the walls of Eleusis were strengthened; excavations have brought to light some ancient sections of walls with fine examples of isodomic masonry (i.e. composed of stones of uniform size). 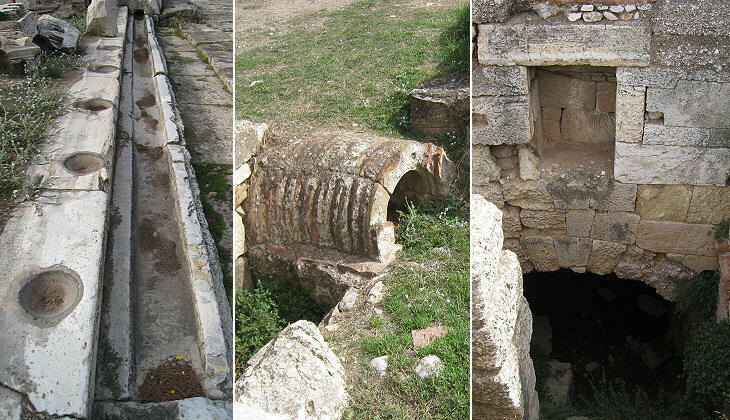 When visiting an archaeological site the history of which includes a Roman period, it is not unusual to find complex engineering works aimed at providing and distributing water; this happens in Eleusis too.